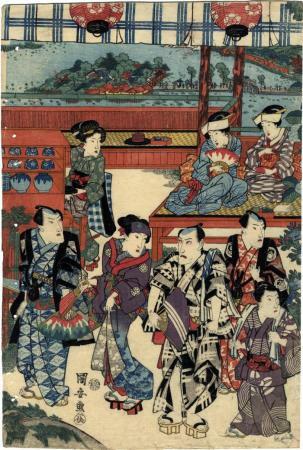 The fellow in the back of the group, on the right, is probably Bandō Hikasaburō, while the figure on the far left is probably Nakamura Utaemon III. To show to you the popularity of this particular spot, geographically, all you have to do is look at the other three prints in the Lyon Collection, by different artists, of basically this same perspective. The first one is by Shunchō from 1787, #1323. The second one is a diptych by Sadatora from the 1830s, #1082. The third one is by Toyokuni II also from the 1830s, #607.